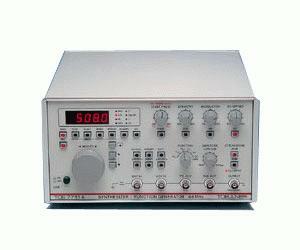 The function generators of the TOE 7700 range represent a series of completely novel design. Besides the usual standard signal shapes including variable signal symmetry, this range is equipped with a lin/log sweep oscillator that should satisfy the most demanding users. Continuous or triggered sweeping is selectable, the lower and upper sweep limits are, of course, separately adjustable, and the sweep frequencies are precisely displayed by an integral frequency counter. Many details reflect the latest advances in circuit technology: a wear-free incremental spinwheel for adjusting the output frequency and sweep time, an internally or externally usable frequency counter that employs a reciprocal counting method, and sophisticated new switching techniques allow signal qualities that were previously unobtainable. All inputs and outputs are floating, with the most important ones arranged on the front panel for east of operation. Functions: sine, triangle, square, pos./neg. pulse, TTL, ECL, variable symmetry, DC. Operating modes: continuously adjustable, internal and external sweep-frequency control, amplifier, frequency counter.